The first words on the inside cover of this book announce that it has been written by one of the world’s leading economists. Part of rising inequality is an unwarranted, and usually unquestioning, acceptance that just a few people are leading and many others simply have to follow, lapping up the trickle down of their great thinking. Milanovic’s big claim in this book is that he has introduced a new concept: Kuznets waves. These ‘can not only satisfactorily explain the most recent spell of increasing inequality but can also be used to predict inequality’s future course in rich countries like the United States or in middle-income countries like China and Brazil‘. Milanovic is not bashful. He thinks he has found a way to foretell the future. Without irony, he has named his new theory after Simon Kuznets, the economist who half a century ago gave his name to a curve. 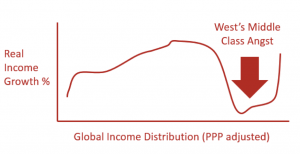 The Kuznets curve predicted that with industrialisation inequality in a society at first rises, then it reaches a peak and then, apparently and theoretically, it falls as long as market forces are allowed to run freely. All this is because initially there would be more and more greed and exploitation, but later some form of trickle down would begin to operate. The reality, of course, is that in the country that Kuznets studied the most, the USA, what actually occurred was the very opposite of this. But in 1971, before that became apparent, Kuznets was awarded the equivalent of the Nobel prize in economics. In the decades that followed it became clear that the Kuznets’ curve theory was wrong. Inequality in the USA rose and rose, partly because economists carried on talking about the Kuznets curves, rather than doing something more useful. At one point in this book the author makes an excursion (Excursus 1.3) to discuss how a particular number, one billion, differs from another number, one million. The book is either not aimed at a very able audience, or its writer believes that it shows some great insight to be able to explain that ‘To transport $1 million in $100 bills requires a medium-sized briefcase. To ferry $1 billion in the same banknotes would require a thousand such briefcases’. If you find such insights illuminating, then this is the book for you. Before explaining why the new theory of Kuznets waves is not convincing I should say that this book does do a fairly good job of describing the basic global distribution of income inequality and how it has been changing very recently. It also lists a series of interesting historical events that were connected to changes in income and wage inequalities, such as the plague and, much later, world wars. But why does the author then feel obliged to try to define a new economic theory; one that he claims will successfully predict the future? Read more as published in the Journal of Critical Social Policy and reviewed by Danny Dorling.